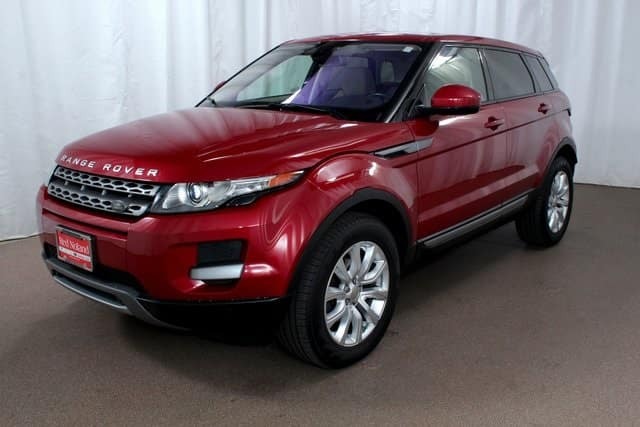 Land Rover Colorado Springs has an amazing 2015 Range Rover Evoque for sale. For less than $29,990, you can own this clean CarFax One-Owner crossover SUV. Powered by a responsive turbocharged 2.0L I4 engine, this stunning Firenze Red Metallic Range Rover is perfect for highway or city driving and has plenty of leg room for passengers. In addition to the responsive power and spacious cabin, you will enjoy the amazing fuel-efficiency of this beautiful Evoque, earning an estimated 21 MPG city/ 30 MPG hwy. Enjoy a suite of luxury premium features including heated front and rear premium leather seats, premium Meridian sound system, Electronic Stability Control, and rear fog lights. Additional features include exterior parking camera, brake assist, heated steering wheel and windshield, 18-inch lightweight alloy wheels, and much more! Stop in to Land Rover Colorado Springs to test drive this amazing gently-preowned 2015 Land Rover Ranger Rover Evoque Pure or inquire about one of our new luxury 2018 Land Rover models available today!